The styrofoam cooler you remember your parents dragging to the beach as a kid is still kicking around a garbage dump somewhere, refusing to break down or disappear. 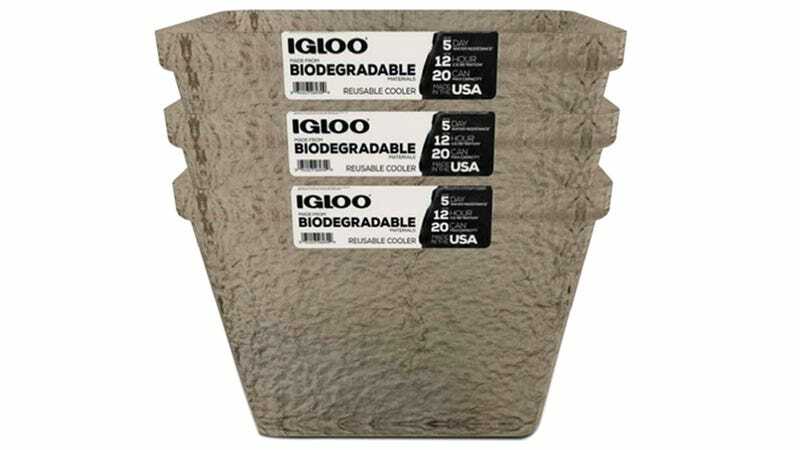 That’s why the industry has switched to reusable products, but if you don’t want to shell out $300+ for a Yeti cooler, Igloo has created a disposable option that’s biodegradable. As spotted by publications like Outside magazine at the 2019 Outdoor Retailer Snow Show that’s happening in Denver this week, Igloo’s new Recool cooler is made from tree pulp instead of those tiny foam beads that will continue to wreak havoc on our eco-systems for years to come. The Recool won’t last quite as long as a result, but it does promise to keep 20 ice-packed cans cool for up to 12 hours, and hold water for up to five days. According to Igloo, it can be dried out and re-used for multiple outings. And when the cooler eventually begins to crumble, wood pulp products can generally be shredded and tossed in your garden where they will biodegrade. Igloo has reportedly managed to get the Recool’s price tag down to just $10 when it goes on sale next month. That’s not much more than what a decent styrofoam cooler will cost you (they still sell those?) so you don’t need to break the bank to be environmentally responsible on your next trip to the beach.